Donald took to twitter to attack the United Steelworkers 1999 for not protecting jobs of Indiana workers. He attacked their job representing workers and called for them to reduce dues. "Chuck Jones, who is President of United Steelworkers 1999, has done a terrible job representing workers," he wrote. "Reduce dues," he continued an hour later. 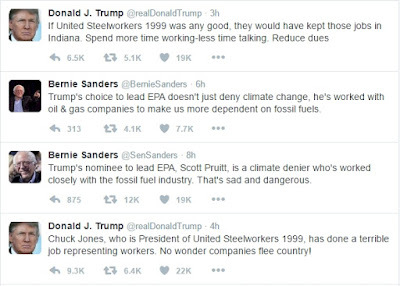 The problem with his tweets is not that the president-elect has nothing better to do with his time than attack individuals and organizations on Twitter but that he demonstrates a complete misunderstanding of, well, everything, but in this particular case he shows just how little he knows about organized labor and the laws that govern them, and in this situation that would be Indiana state law. You see, Indiana is a "right-to-work" state. While that phrase makes it sound like finding and keeping a job is a god-given right that all can enjoy in a nurturing environment, Trump's tweets actually highlight the problems with such laws. The Indiana law actually prohibits a union from mandating non-members pay fees to the union representing them, which leads to the second tweet - What does it matter if they reduce dues or not when the state legislature and supreme court prevents them from collecting from those they represent? While it may make a nice soundbite and rally call it is laws like these that weaken unions and drive down wages, benefits, and living standards for all workers - those same workers that believed Trump was going to make America great again and bring back their jobs.